Enjoy new ways of slicing and serving cheese with bamboo Royal Craft Wood cheese board! The board is made from 100%-organic thick bamboo wood, BPA free and completely safe and natural. In addition, bamboo fruit and cheese serving platter is water-resistant and antibacterial. The bamboo square cheese board has a smooth surface which is perfect for your knife. Besides, there won't be any marks left from the knife. This perfect cheese board is often used as a cutting board. It also has additional spaces for meat and crackers which makes the board a perfect wine and cheese serving tray for parties. A good gift should be both good-looking and useful. 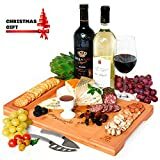 That's why the unique wooden cheese board is a perfect fit for a housewarming gift. It will make a good decoration for the kitchen because of the custom bamboo wood and will be used frequently. Our clients' opinions matter to us. We are proud to deliver the highest quality of our cheese serving accessories and happy to offer you a risk-free no-questions-asked guarantee.